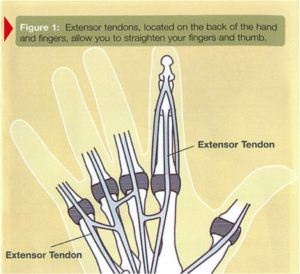 Extensor tendons, located on the back of the hand and fingers, allow you to straighten your fingers and thumb (see Figure 1). These tendons are attached to muscles in the forearm. As the tendons continue into the fingers, they become flat and thin. In the fingers, these tendons are joined by smaller tendons from the muscles in the hand. 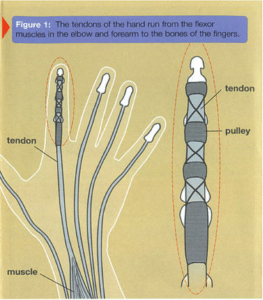 It is these small-muscle tendons that allow delicate finger motions and coordination. Extensor tendons are just under the skin, directly on the bone, on the back of the hands and fingers. Because of their location, they can be easily injured even by a minor cut. Jamming a finger may cause these thin tendons to rip apart from their attachment to bone. After this type of injury, you may have a hard time straightening one or more joints. Treatment is necessary to return use to the tendon. Cuts that split the tendon may need stitches, but tears caused by jamming injuries are usually treated with splints. Splints stop the healing ends of the tendons from pulling apart and should be worn at all times until the tendon is fully healed. Your doctor will apply the splint in the correct place and give you directions on how long to wear it. Sometimes a pin is placed through the bone across the joint as an internal splint. 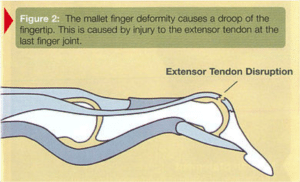 Mallet finger refers to the droop of the end joint where an extensor tendon has been cut or separated from the bone (see Figure 2). Sometimes a piece of bone is pulled off with the tendon, but the result is the same: a fingertip that cannot be straightened. Whether the tendon injury is caused by a cut or jammed finger, splinting is necessary. Often the cut tendon requires stitches. Splinting is done to keep the fingertip straight until the tendon is healed. The size of the splint and length of time you will have to wear is determined by the type and location of your injury. The splint should remain in place constantly during this time. The tendon may take four to eight weeks, or longer in some patients, to heal completely. Removing the splint early may result in drooping of the fingertip, which may then require additional splinting. Your physician will instruct you to remove the splint at the proper time. 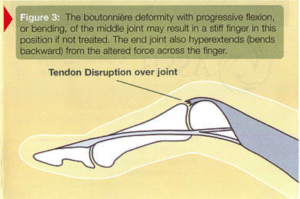 Boutonnière deformity describes the bent-down (flexed) position of the middle joint of the finger from a cut or tear of the extensor tendon (see Figure 3). Treatment involves splinting the middle joint in a straight position until the injured tendon is fully healed. Sometimes, stitches are necessary when the tendon has been cut. If this injury is not treated, or if the splint is not worn property, the finger can quickly become even more bent-down and finally stiffen in this position. Be sure to follow your physician’s instructions and wear your splint for a minimum of four-to-eight weeks. Your doctor will tell you when you may stop wearing the splint. Lacerations or cuts on the back of the hand that go through the extensor tendons cause difficulty in straightening the finger at the large joint where the fingers join the hand. These injuries are usually treated by stitching the tendon ends together. 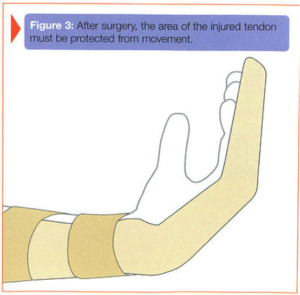 Splinting for a tendon injury in this area may include the wrist and part of the finger. Dynamic splinting, which is a splint with slings that allows some finger motion, may be used for injuries of this kind. The dynamic splint allows early movement and protects that healing tendon. Extensor tendon injuries may cause the tendon to attaché itself to nearby bone and scar tissue. Many factors can affect the seriousness of the injury, including fracture, infection, and individual differences. The scar tissue that forms may prevent full-finger bending and straightening even with the best treatment. To improve motion, therapy may be necessary. Surgery to free scar tissue may sometimes be helpful in serious cases of motion loss. Your physician will explain the risks and side effects of the various treatments for extensor tendon. The muscles that bend or flex are called flexor muscles. These flexor muscles move the fingers through cord-like extensions called tendons, which connect the muscles to bone. The flexor muscles start from the elbow and forearm regions, turn into tendons just past the middle of the forearm, and attach into the bones of the fingers (see Figure 1). In the finger, the tendons pass through fibrous rings called pulleys, which guide the tendons and keep them close to the bones, enabling the tendons to move the joints much more effectively. Deep cuts on the palm side of the wrist, hand, or fingers can injure the flexor tendons and nearby nerves and blood vessels. The injury may appear simple on the outside, but is actually much more complex on the inside. When a tendon is cut, it acts like a rubber band, and its cut ends pull away from each other. A tendon that has not been cut completely through may still allow the fingers to bend, but can cause pain or catching and may eventually tear all the way through. When tendons are cut completely through, the finger joints cannot bend on their own (see Figure 2). Tendons are made of living cells. If the cut ends of the tendon can be brought back together, healing begins through the cells inside as well as the tissue outside of the tendon. Because the cut ends of a tendon usually separate after an injury, it is not likely that a cut tendon will heal without surgery. Your doctor will advise you on how soon surgery is needed after a flexor tendon is cut. There are many ways to repair a cut tendon, and certain types of cuts need a specific type of repair. 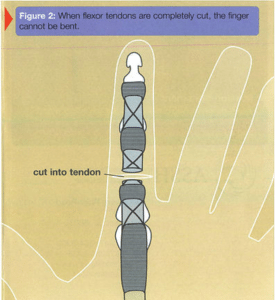 In the finger, it is important to preserve certain pulleys, and there is very little space between the tendon and pulley in which to perform a repair. Nearby nerves and blood vessels may need to be repaired as well. After surgery, and depending on the type of cut, the injured area can either be protected from movement or started on a very specific limited-movement program for several weeks (see Figure 3). Your doctor may prescribe hand therapy for you after surgery. If unprotected finger motion begins too soon, the tendon repair is likely to pull apart. After four-to-six weeks, the fingers are allowed to move slowly and without resistance. Healing takes place during the first three months after the repair.In most cases, full and normal movement of the injured area does not return after surgery, If it is hard to bend the finger using its own muscle power, it could mean that the repaired tendon has pulled apart or is bogged down in scar tissue. Scarring of the tendon repair is a normal part of the healing process. But in some cases, the scarring can make bending and straightening of the finger very difficult. Depending on the injury, your doctor may prescribe therapy to loosen up the scar tissue and prevent it from interfering with the finger’s movement. If therapy fails to improve motion, surgery to release scar tissue around the tendon may be required.